I was recently sitting in a poorly produced play called That Hopey Changey Thing when, looking wistfully at my watch, I noticed that the hour hand and the minute hand were perfectly lined up, pointing in opposite directions. I stayed awake for the rest of the show in part thanks to the thought puzzle of how many times a day this happens, and how best to determine exactly when. Here’s an answer using Mathematica. First, I found it useful to think of time in terms of a unit clock cycle — the hands on our theoretical clock run from 0 to 1, rather than to 12. The following Manipulate command draws a clock, allowing the user to set the unit time, and translating it into both conventional time and the angle of the minute and hour hands. This was useful when debugging the formulae for the conversions; any error was immediately apparent. 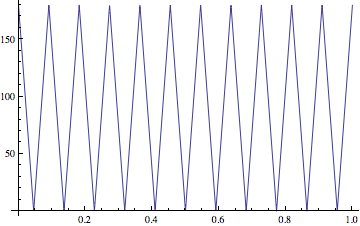 and we see as expected a periodic function. There are 11 solutions when “unstraightness” == 0 per day, which makes perfectly good sense when you think about it. but sadly, this yields nothing but error messages. What to do? I decided on brute force. Slice the day into 1,000,000 pieces and identify the 11 times which produce the most opposed clock hands. Clearly, my bored glance at my watch had been at 8:10:54 pm. 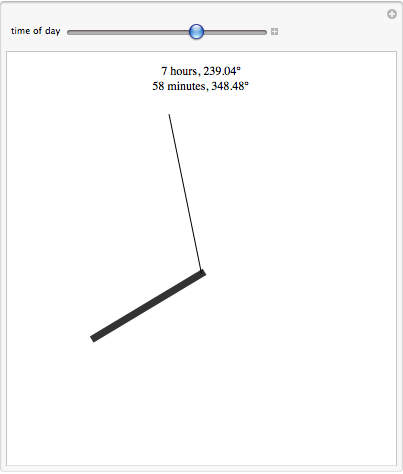 This entry was posted in mathematica on November 19, 2010 by stern.